Gilgamesh[a] was a historical king of the Sumerian city-state of Uruk, a major hero in ancient Mesopotamian mythology, and the protagonist of the Epic of Gilgamesh, an epic poem written in Akkadian during the late second millennium BC. He probably ruled sometime between 2800 and 2500 BC and was posthumously deified. He became a major figure in Sumerian legends during the Third Dynasty of Ur (c. 2112 – c. 2004 BC). Tales of Gilgamesh's legendary exploits are narrated in five surviving Sumerian poems. The earliest of these is probably Gilgamesh, Enkidu, and the Netherworld, in which Gilgamesh comes to the aid of the goddess Inanna and drives away the creatures infesting her huluppu tree. She gives him two unknown objects called a mikku and a pikku, which he loses. After Enkidu's death, his shade tells Gilgamesh about the bleak conditions in the Underworld. The poem Gilgamesh and Agga describes Gilgamesh's revolt against his overlord King Agga. Other Sumerian poems relate Gilgamesh's defeat of the ogre Huwawa and the Bull of Heaven and a fifth, poorly preserved one apparently describes his death and funeral. 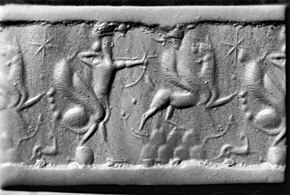 Akkadian cylinder seal impression from Girsu (c. 2340 - 2150 BC) showing a mythological scene. The figure in the center appears to be a god, perhaps Gilgamesh, who is bending the trunk of a tree into a curve as he chops it down. Underneath the tree, a god ascending from the Underworld hands a mace-like object to a goddess. 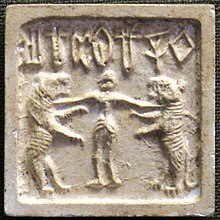 Indus valley civilization seal, with the Sumerian "Gilgamesh" motif of a man fighting two lions (2500-1500 BC), an indicator of Indus-Mesopotamia relations. In the epic, Gilgamesh is introduced as "two thirds divine and one third mortal". At the beginning of the poem, Gilgamesh is described as a brutal, oppressive ruler. This is usually interpreted to mean either that he compels all his subjects to engage in forced labor or that he sexually oppresses all his subjects. As punishment for Gilgamesh's cruelty, the god Anu creates the wildman Enkidu. After being tamed by a prostitute named Shamhat, Enkidu travels to Uruk to confront Gilgamesh. In the second tablet, the two men wrestle and, although Gilgamesh wins the match in the end, he is so impressed by his opponent's strength and tenacity that they become close friends. In the earlier Sumerian texts, Enkidu is Gilgamesh's servant, but, in the Epic of Gilgamesh, they are companions of equal standing. In tablets III through IV, Gilgamesh and Enkidu travel to the Cedar Forest, which is guarded by Humbaba (the Akkadian name for Huwawa). The heroes cross the seven mountains to the Cedar Forest, where they begin chopping down trees. Confronted by Humbaba, Gilgamesh panics and prays to Shamash (the East Semitic name for Utu), who blows eight winds in Humbaba's eyes, blinding him. 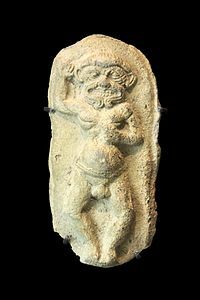 Humbaba begs for mercy, but the heroes decapitate him regardless. 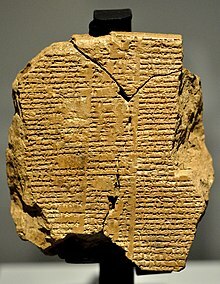 Tablet VI begins with Gilgamesh returning to Uruk, where Ishtar (the Akkadian name for Inanna) comes to him and demands him to become her consort. Gilgamesh repudiates her, insisting that she has mistreated all her former lovers. In revenge, Ishtar goes to her father Anu and demands that he give her the Bull of Heaven, which she sends to attack Gilgamesh. Gilgamesh and Enkidu kill the Bull and offer its heart to Shamash. While Gilgamesh and Enkidu are resting, Ishtar stands up on the walls of Uruk and curses Gilgamesh. Enkidu tears off the Bull's right thigh and throws it in Ishtar's face, saying, "If I could lay my hands on you, it is this I should do to you, and lash your entrails to your side." Ishtar calls together "the crimped courtesans, prostitutes and harlots" and orders them to mourn for the Bull of Heaven. Meanwhile, Gilgamesh holds a celebration over the Bull of Heaven's defeat. Early Middle Assyrian cylinder seal impression dating between 1400 and 1200 BC, showing a man with bird wings and a scorpion tail firing an arrow at a griffin on a hillock. A scorpion man is among the creatures Gilgamesh encounters on his journey to the homeland of Utnapishtim. The journey to Utnapishtim involves a series of episodic challenges, which probably originated as major independent adventures, but, in the epic, they are reduced to what Joseph Eddy Fontenrose calls "fairly harmless incidents." First, Gilgamesh encounters and slays lions in the mountain pass. Upon reaching the mountain of Mashu, Gilgamesh encounters a scorpion man and his wife; their bodies flash with terrifying radiance, but, once Gilgamesh tells them his purpose, they allow him to pass. Gilgamesh wanders through darkness for twelve days before he finally comes into the light. He finds a beautiful garden by the sea in which he meets Siduri, the divine barmaid. At first she tries to prevent Gilgamesh from entering the garden, but later she instead attempts to persuade him to accept death as inevitable and not journey beyond the waters. When Gilgamesh refuses to do this, she directs him to Urshanabi, the ferryman of the gods, who ferries Gilgamesh across the sea to Utnapishtim's homeland. When Gilgamesh finally arrives at Utnapishtim's home, Utnapishtim tells Gilgamesh that, to become immortal, he must defy sleep. Gilgamesh fails to do this and falls asleep for seven days without waking. 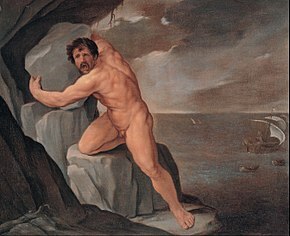 The episode involving Odysseus's confrontation with Polyphemus in the Odyssey, shown in this seventeenth-century painting by Guido Reni, bears similarities to Gilgamesh and Enkidu's battle with Humbaba in the Epic of Gilgamesh. 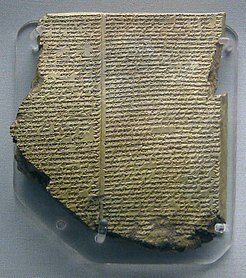 The Epic of Gilgamesh exerted substantial influence on the Iliad and the Odyssey, two epic poems written in ancient Greek during the eighth century BC. According to Barry B. Powell, an American classical scholar, early Greeks were probably exposed to Mesopotamian oral traditions through their extensive connections to the civilizations of the ancient Near East and this exposure resulted in the similarities that are seen between the Epic of Gilgamesh and the Homeric epics. Walter Burkert, a German classicist, observes that the scene in Tablet VI of the Epic of Gilgamesh in which Gilgamesh rejects Ishtar's advances and she complains before her mother Antu, but is mildly rebuked by her father Anu, is directly paralleled in Book V of the Iliad. In this scene, Aphrodite, the later Greek adaptation of Ishtar, is wounded by the hero Diomedes and flees to Mount Olympus, where she cries to her mother Dione and is mildly rebuked by her father Zeus. Powell observes that the opening lines of the Odyssey seem to echo the opening lines of the Epic of Gilgamesh. The storyline of the Odyssey likewise bears numerous similarities to that of the Epic of Gilgamesh. 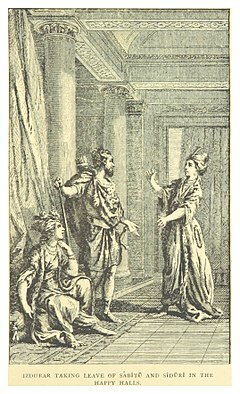 Both Gilgamesh and Odysseus encounter a woman who can turn men into animals: Ishtar (for Gilgamesh) and Circe (for Odysseus). In the Odyssey, Odysseus blinds a giant Cyclops named Polyphemus, an incident which bears similarities to Gilgamesh's slaying of Humbaba in the Epic of Gilgamesh. Both Gilgamesh and Odysseus visit the Underworld and both find themselves unhappy whilst living in an otherworldly paradise in the presence of an attractive woman: Siduri (for Gilgamesh) and Calypso (for Odysseus). Finally, both heroes have an opportunity for immortality but miss it (Gilgamesh when he loses the plant, and Odysseus when he leaves Calypso's island). Existential angst during the aftermath of World War II significantly contributed to Gilgamesh's rise in popularity in the middle of the twentieth century. 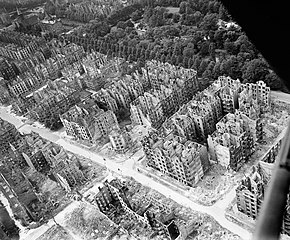 For instance, the German novelist Hermann Kasack used Enkidu's vision of the Underworld from the Epic of Gilgamesh as a metaphor for the bombed-out city of Hamburg (pictured above) in his 1947 novel Die Stadt hinter dem Strom. 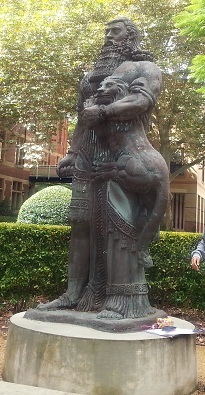 A modern statue of Gilgamesh stands at the University of Sydney. ^ /ɡɪlˈɡɑːmɛʃ/, commonly but incorrectly /ˈɡɪlɡəˌmɛʃ/; 𒄑𒂅𒈦, Gilgameš, originally Bilgamesh 𒄑𒉈𒂵𒈩. His name translates roughly to mean "The Ancestor is a Young-man", from Bil.ga "Ancestor", Elder:33 and Mes/Mesh3 "Young-Man". :174 See also The Electronic Pennsylvania Sumerian Dictionary. ^ Delorme 1981, p. 55. ^ George, Andrew R. (2010) . The Babylonian Gilgamesh Epic – Introduction, Critical Edition and Cuneiform Texts (in English and Akkadian). vol. 1 and 2 (reprint ed.). Oxford: Oxford University Press. p. 163. ISBN 978-0198149224. OCLC 819941336. .
^ a b c d e f g h i j k l m n o p q r s t u v w x Black & Green 1992, p. 89. ^ a b c Dalley 1989, p. 40. ^ a b c Kramer 1963, pp. 45–46. ^ a b c Powell 2012, p. 338. ^ a b c d e f g h i j k l m n o p q r s t u v w Mark 2018. ^ a b Kramer 1963, p. 46. ^ "Gilgamesh tomb believed found". BBC News. 29 April 2003. Retrieved 12 October 2017. ^ Possehl, Gregory L. (2002). The Indus Civilization: A Contemporary Perspective. Rowman Altamira. p. 146. ISBN 9780759116429. ^ Kosambi, Damodar Dharmanand (1975). An Introduction to the Study of Indian History. Popular Prakashan. p. 64. ISBN 9788171540389. ^ a b Kramer 1963, p. 45. ^ George 2003, p. 141. ^ a b c d e f g h i j k Fontenrose 1980, p. 172. ^ a b c d Fontenrose 1980, pp. 172–173. ^ a b Fontenrose 1980, p. 173. ^ a b Fontenrose 1980, p. 167. ^ a b c d e f g h i j Fontenrose 1980, p. 168. ^ a b c d e f g h i j k l m n o p q r s t u v w x y z aa ab ac ad Black & Green 1992, p. 90. ^ a b c d Tigay 2002, pp. 24–25. ^ a b c Rybka 2011, pp. 257–258. ^ a b c Powell 2012, p. 339. ^ Black & Green 1992, pp. 89–90. ^ a b Pryke 2017, pp. 140–159. ^ a b c Fontenrose 1980, pp. 168–169. ^ George 2003, p. 88. ^ a b c d e f g h i j k l m n Fontenrose 1980, p. 171. ^ a b c d e f Tigay 2002, pp. 26–27. ^ a b Tigay 2002, p. 26. ^ a b c d e f g h i j k l m n o p q r s t Black & Green 1992, p. 91. ^ a b c d Anderson 2000, pp. 127–128. ^ West 1997, pp. 334–402. ^ Burkert 2005, pp. 297–301. ^ Powell 2012, pp. 338–339. ^ a b Burkert 2005, pp. 299–300. ^ a b c d e Anderson 2000, p. 127. ^ Burkert 2005, pp. 299–301. ^ a b George 2003, p. 60. ^ Burkert 2005, p. 295. ^ George 2003, p. 61. ^ a b c d Ziolkowski 2012, pp. 1–25. ^ Ziolkowski 2012, pp. 20–28. ^ Rybka 2011, p. 257. ^ a b c d e f g h i j k l m n o p q r s Ziolkowski 2011. ^ Smith, George. "The Chaldean Account of the Deluge". Transactions of the Society of Biblical Archaeology, Volumes 1-2. 1–2. London: Society of Biblical Archæology. pp. 213–214. Retrieved 12 October 2017. ^ Jeremias, Alfred (1891). Izdubar-Nimrod, eine altbabylonische Heldensage (in German). Retrieved 12 October 2017. ^ a b c d e Ziolkowski 2012, pp. 23–25. ^ Ziolkowski 2012, pp. 28–29. ^ Ziolkowski 2012, pp. 23–25, 28–29. ^ a b c d Ziolkowski 2012, p. 25. ^ a b c d e f g h Ziolkowski 2012, p. 21. ^ Ziolkowski 2012, pp. 22–23. ^ a b c d e f g Ziolkowski 2012, p. 26. ^ a b c d Ziolkowski 2012, pp. 26–27. ^ a b Ziolkowski 2012, p. 27. ^ a b c Ziolkowski 2012, p. 28. ^ a b c Ziolkowski 2012, p. 29. ^ Ziolkowski 2012, pp. 29–30. ^ a b c d Ziolkowski 2012, p. 30. ^ Ziolkowski 2012, p. xii. ^ a b Stone 2012. ^ Ziolkowski 2012, pp. xii–xiii. ^ a b c Damrosch 2006, p. 254. ^ Damrosch 2006, pp. 254–255. ^ a b c d e f g h i Damrosch 2006, p. 255. ^ Damrosch 2006, pp. 254–257. ^ Damrosch 2006, p. 257. ^ Damrosch 2006, pp. 259–260. ^ Damrosch 2006, p. 260. Foster, Benjamin R., ed. (2001). The Epic of Gilgamesh. Translated by Foster, Benjamin R. New York: W.W. Norton & Company. ISBN 978-0-393-97516-1. The Epic of Gilgamesh. Translated by Kovacs, Maureen Gallery. Stanford University Press: Stanford, California. 1989 . ISBN 978-0-8047-1711-3. Glossary, Appendices, Appendix (Chapter XII=Tablet XII).